Traveling by bus has always been a social and somewhat inexpensive way to get around. There you are, pleasantly chatting with someone in the next seat on your way to visit a friend. In the next instant, that conversation is brought to a terrifying and screeching halt. An unexpected bus accident, caused by someone else’s careless mistake, has changed your life forever. Ever-increasing traffic and the rising costs of maintaining a vehicle have led many people to travel by bus. When you board a bus and pay for that seat, you have a right to expect that the bus has been inspected and the driver is rested, attentive, and qualified. When bus companies or drivers do not do everything they can to ensure the safety of their passengers, they are not fulfilling their obligation and could be to blame if the bus is involved in an accident. Bus accidents, which are responsible for an average of 320 deaths per year and thousands of life-altering injuries, are frequently caused by faulty equipment that has not been inspected properly or at recommended intervals. In some cases, maintenance shortcuts were taken to save money and increase company profits. Such negligent practices can result in accidents that could—and should—have been avoided. Driving without rest. Drivers are often scheduled to drive on inadequate rest, which may cause them to make more mistakes than they normally would. Additionally, many drive too fast as they try to abide by the tight schedules imposed on them by the bus company. Driving under the influence. Because bus drivers are responsible for so many lives, they are held to a higher standard when it comes to drug and alcohol use. Bus companies are responsible for conducting random tests, and any driver involved in an accident should immediately be tested for these substances. Distracted driving. Accidents can occur when a driver becomes distracted by texting or talking on a cell phone. If you are injured in an accident caused by a distracted bus driver, it’s important to get legal advice immediately. Cell phone companies do not keep records forever, and successful legal action may depend on obtaining those records as soon as possible. Most major bus accidents could be avoided if the standards set by the industry were followed properly. You put your trust in the company and driver that you are hiring to transport you. If you or someone you love is injured or killed in a Michigan bus accident, your life could be changed forever. Physical, mental, and emotional issues can last for years and can be financially devastating. 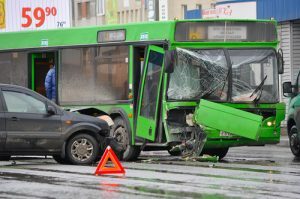 It is vital to get good legal advice following a bus accident. At Thurswell Law, we have earned a reputation for excellence and will do all we can to make sure you and your family receive the monetary compensation you deserve. Call Thurswell Law at 248-354-2222 for a free consultation. There is no fee unless you collect.